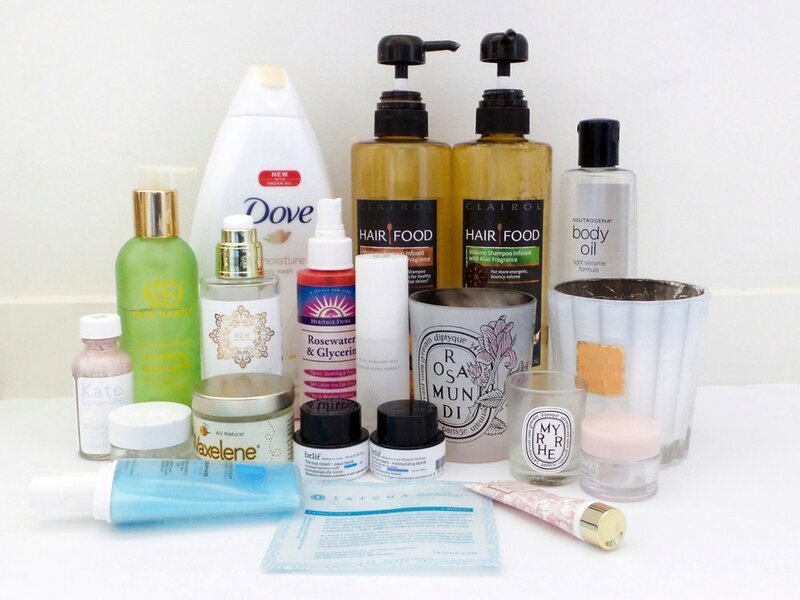 There are so many reasons why this post hasn't happened sooner, but I thought it was about time I emptied out my bags that I've been collecting my used up products in. I think I've managed to do a decent job using things up (yay me!) but there's probably always room for more. (Ha!) 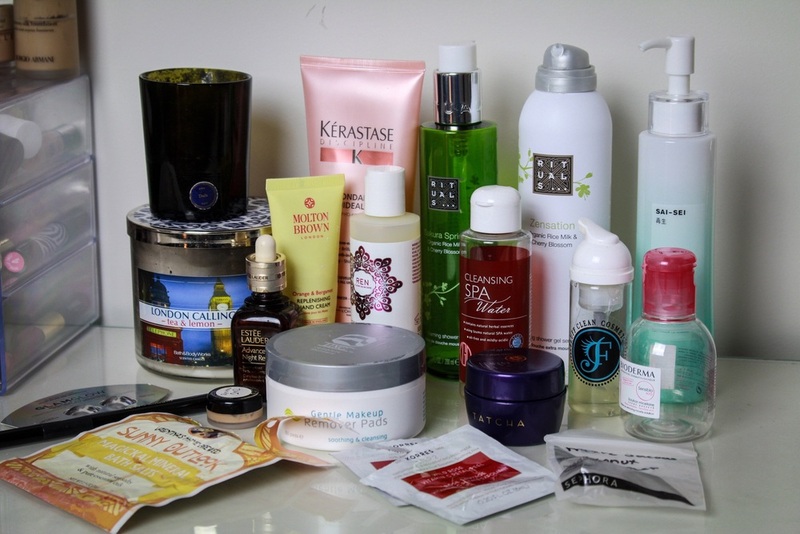 Since there are quite a few items, I thought I would break it down by category and list the products, whether or not I repurchased it, and link any applicable reviews. Of course, if there's anything you would like to hear about in more detail, feel free to let me know in the comments below! Bioderma - would not repurchase, since I have more and prefer the Koh Gen Do just slightly more. Review here. Koh Gen Do Cleansing Spa Water - have repurchased many times but would like to try something new. Review here. Ling Skincare Gentle Makeup Remover Wipes - repurchased. I enjoy these but it is sort of a pain to pay $11 shipping for just these, so I'm not sure I would get them again unless I could get them in person. Estee Lauder Advanced Night Repair Serum - would not repurchase, since I still have one more small bottle and far too many serums. I do think it is a good everyday serum though, if you're in the market for one. Review here. Unnamed makeup remover - would not repurchase. I got this from a place I went to for lash extensions and felt whatever about it overall. Heritage Store Rosewater & Glycerin - would repurchase, but I don't need any more face sprays right now. Belif The True Cream Moisturizing Bomb - repurchased, but trying to go through the rest of my stuff before I buy it again. Omorovicza Queen of Hungary Mist - would not repurchase, purely because it is quite pricey. I do think it is a nice product though, and my skin definitely missed it when it was gone! Kate Somerville Eradikate - would repurchase, but I bought the Mario Badescu version and I think I like the Kate one better! The scent is better and it doesn't sting! Omorovicza Thermal Cleansing Balm - would not repurchase. I'm too lazy for cleansing balms although this is such a nice one. If it wasn't quite so pricey, I would repurchase it for when I'm not too lazy though. Review here. Kérastase Discipline Conditioner * - would repurchase, but haven't, since it takes ages for me to get through shampoo and conditioner. I really love the Discipline range though, and will be buying the shampoo once I use up more stuff. Review here. Hairfood Moisture Shampoo Infused with Honey Apricot Fragrance* - would not repurchase. This was okay, and I didn't mind using it up, but I liked the Volume version below better, and I'm still loving the Kerastase range more. Hairfood Volume Shampoo Infused with Kiwi Fragrance* - might repurchase, if was looking for a wallet friendly shampoo. This one worked well for my hair but I'm really hoping to splurge on Kerastase or Shu Uemura next! Tatcha Indigo Soothing Silk Body Butter* - might repurchase. I think this is such a good one for dry skin, and I would definitely splurge on this if my skin was super dry or irritated. Review here. Molton Brown Orange & Bergamot Replenishing Hand Cream* - wouldn't repurchase for myself, although I would purchase these for gifting. They make such fantastic gift sets during the holidays, and all of the scents are great. I just have other hand creams I like even more. Review here. Rituals Zensation Foaming Shower Gel Sensation in Organic Milk & Cherry Blossom* - would repurchase. I like this product though I wasn't raving about the scent, so I'd be curious to try their other scents. It was fun that it foamed up and it didn't dry out my skin. It looks like they've updated this product (or at least the packaging) and it is a lot more affordable than I expected at $15. Rituals Sakura Spring Shower Oil* - would repurchase. Just like the above Rituals product, I thought this was quite nice, and again is more affordable than I was expecting. I need to check out the whole range in person! Sai Sei Mineral Body Veil* - would not repurchase. This was a nice light body lotion that I enjoyed using in the summer, but this seems to be discontinued at Space NK now and harder to get a hold of. Ren Moroccan Rose Otto Body Wash - might repurchase. I liked the scent and the overall feel of the product, but at $27 a bottle, it is a little more than I want to spend. But if there was a good deal on a set or something, I would get this! Valentina's Naturals Sunny Outlook Bath Salt - might repurchase. Found these at Whole Foods and LOVED this particular scent. Never remembered to buy them again but I wouldn't object to trying another pack! Dove DryOil Moisture Nourishing Body Wash* - would repurchase. I love these Dove body washes and they're so affordable. I really liked this one in the winter, cause it seemed even more hydrating than the rest! Neutrogena Sesame Body Oil - repurchased several times before. I like throwing this in a bath, and it is relatively inexpensive compared to other stuff out there. Tata Harper Fortifying Body Lotion* - might repurchase. This was so nice to use. Not greasy, hydrating and just felt good! It is a bit pricier than I would want to spend on body lotion given my current terrible habits with body lotion, lol. Ren Moroccan Rose Gold Glow Perfect Dry Oil* - might repurchase. This was really lovely too, but I have too many things to use up now. I quite liked using this on my legs though, to hydrate and give them shine! Review here. Aerin Rose Hand & Body Cream - would not repurchase. The scent was okay, but the lotion just wasn't as hydrating as other stuff that I have, and it sometimes felt a bit greasy or something if you reapplied. Love the packaging though! Glamglow Brightmud Eye Treatment - would not purchase, probably not for my skin type. I remember thinking it was way too intense for me. Korres Wild Rose Petal Peel - would not purchase. My skin has been so reactive this year, and I think this was too intense for me. I would definitely try it again another time, though! Tatcha Aburatorigami Japanese Blotting Papers - would purchase, if I felt splurgy. Although they're not super expensive... they are NICE, but do I really need them? A few others I'm not sure what they were anymore! Cire Trudon Dada - repurchased, cause I love it. Review here. Bath & Body Works London Calling - would not repurchase, unless I was out of candles and needed something affordable. I liked it, but I'd rather save up for something luxe! Diptyque Rosamundi - love this to death. Would repurchase it if I could, but sadly it was limited edition. Diptyque Myrrhe - would not repurchase. To me, this scent just doesn't have a lot of throw and I just don't get much from the scent either. But my nose isn't all that strong! Tocca Stella* - would not repurchase as there are too many other candles I want to try right now. Review here. My husband shares a lot of my products, but he does often use things up all on his own. It is nearly impossible for me to keep track of his empties, especially since he often discards the empty containers if he is traveling. But, I know he used the below products almost entirely on his own, so I thought I would share some of his thoughts on them too. Clinique Moisture Surge - he'll always use this if I have it around, especially in the winter. This is such a popular Clinique product and I can see why - it is a great all around moisturizer! Belif The True Cream Aqua Bomb - he's loving this one a lot this year, as he contributed to using up my very first jar and then used up a few sample sizes AND a travel size I bought him. Review here. Waxalene - he liked using this on eczema patches in the winter, though I'm not sure he misses it. We shall see! Reviews here and here. La Roche Posay Hydraphase Intense Riche* - he's a fan of La Roche Posay suncare so he was totally willing to try this. He had no complaints about this one but clearly preferred the Belif and Clinique moisturizers to this one. Somewhere along the line, I've also used up some Lush bath bombs, but those are always tough to keep track of! Also, I'm noticing I use a ton of stuff I never even post about! (Does that happen to you too?) Anyway, if you've made it this far I commend you. How have you been doing with your empties this year? I'd love to know!